The last time I took our two Persians to the mixed dog and cat groomer it did not go as it normally does. Daisy really hated being around all the dogs and became way too stressed. So in an effort to make it easier on her, as well as more convenient for me, we decided to give our favorite cat sitter a try. And we are happy that we did! 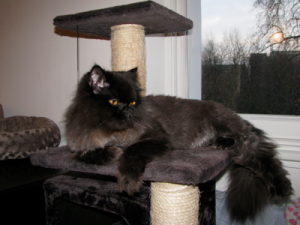 The cats already were comfortable with Anita, and being groomed in their environment made it fairly stress free. Yes, they did cry and try to wiggle away, but they were never in pain and Anita took great care to make sure they were safe and comfortable. For me, it was great to be a part of the experience. They were not the angels the other groomer said they were! Thanks Anita for taking the time and care to keep our animal family clean and healthy, we will definitely have you groom again!